Traffic Brokers Scam: The Painful But Honest Truth… Aww, Too Bad! I’m amazed at what I see people try to pass off as a legitimate product and Traffic Brokers is nothing new. It really upsets me that people are out there creating rubbish and passing it off at “legitimate ways to make money online” because it gives us who genuinely want to help you become successful, not just take your money, a bad name. I’m not an affiliate for Traffic Brokers. I’d rather sleep knowing I’ve helped people than make a quick dollar… And now I’ll show you why you shouldn’t go near this product. In this review I’ll show you why this product just screams SCAM to me and not only will you know to stay away from this product, but I hope you’ll also learn what to look for in other products online when you come across them. In the internet marketing world there’s a little phrase we like to use called SOS, or Shiny Object Syndrome. 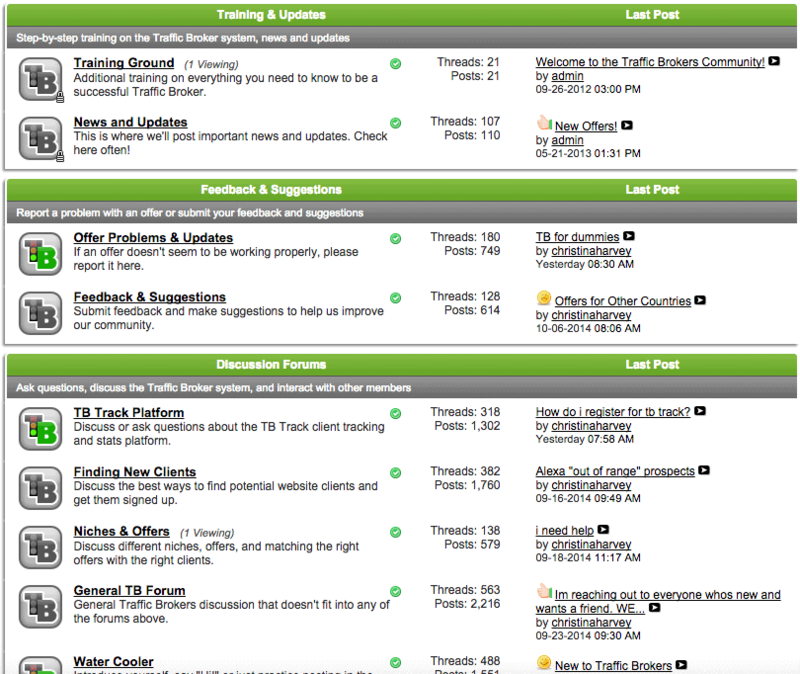 Traffic Broker is just that. It flashes some big numbers to get your mouth watering and get you dreaming of yourself making that sort of money. It’s true, you can make a lot of money online, but you’ll never reach it with useless information. Selling crappy products is how people online can show you big income reports and flashy screenshots. They make a bunch of money ripping people off and then show you their screenshots saying, “Oooh – don’t you want a piece of this? !” The strategies they teach when you sign up for the product are far from helpful though, and I’ll make it clear case for that in this Traffic Brokers review. This is the classic sales pitch that comes along with products that are all hype and fluff. Just the fact that it starts with a “my friend asked me…” and then show s a crazy specific amount of money just says to me that they are either 1) flaunting the money they’re making by ripping people like you off or 2) they’re lying to grab your attention. Either way, these aren’t the people I would like to affiliate myself with or even consider looking towards to help grow an online business. When you’re looking for someone to show you how to build an online business, you want someone who legitimately wants to help you. Everything on this Traffic Brokers sales page is about showing you how he’s found the magic formula and how he’ll show you how you can make 6 figures. Yes, it says that you may not achieve results like this, but that’s just the legal fluff necessary for any “make money online” product. You’ll see this statement on any product that deals with making money. This doesn’t mean anything. Do You Know What You’re Buying? Jeff Walker is great in getting people’s attention and pulling on the heartstrings of those who desperately wish to make some money online. But do you know what you’re actually paying for? 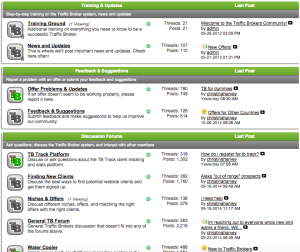 There are many free forums you can sign up with and save yourself the $50 per month price tag that comes along with Traffic Brokers. Yes there are some forums that are still incredibly useful and of great value, but I’m afraid this isn’t one them. There are many other superior products out there that you can sign up to, for less money too, that will provide you with so much more. There’s a table at the bottom of this post that compares Traffic Brokers to our top recommendation. It shows you what you can get for your money which is less than this outdated, inactive forum. And it’s free to join – something Traffic Brokers promises on the initial sales page but doesn’t deliver. Do you like being in the back of the pack only to find out you’ve been doing everything wrong? That’s what you’ll get if you follow the information in Traffic Brokers’ members’ area. Now You’re After More Money!? Before you’re given any information, before you actually learn anything, BEFORE you even get to the outdated forum you’re asked to cough up more money. So not only are you paying $49.95 for a forum, but now you’re asked to pay an extra $4.95 per month for a website. But wait, you’re getting $1995 worth of “stuff” for that $4.95… Pfft! Products like this just ask for more money before you get started for the sole purpose of making more money off of you. Overall, this product isn’t THAT bad regarding upsells. Normally you’ll see something that’s more than 3x the price of the initial access before you can get started. Just look at Ian’s Empower Network review and you’ll see what I mean. You’ve just paid to get access to the website. Now it seems Jeff Walker is just trying to get every penny possible from you. Nothing here warrants the price tag Jeff Walker is asking for Traffic Brokers. If I were to purchase this the most I’d pay is $15-20 as a one-time payment, just to see if there were any awesome little nuggets in there. I think that’s even being a little generous. If the product were updated and provided more value it could be worth the price tag. The bit that made me more upset than anything was when I conducted this review I could see that there were 2 new members to the site that were logged in. That means AT LEAST 2 people had bought into the hype that was on the poor sales page. There could have been more than 2. At least 2 people are going to get disappointed, lose faith in that the internet can provide an income for anybody and also reinforce the bad reputation this industry already has. I really hope I’ve shown you want to look out for, not with just this product, but for any product out there. All the good ones out there provide you with a trial, an example of there work, or even help you out for free. This is what Ian and I do here, we’re giving you all the information for free and the recommendations we provide are based on our experiences. Is it easy to get help? Do you agree with everything I’ve written here? I’d love to hear what you have to say about Traffic Brokers and whether or not you agree with what I’ve written here. Or if you’ve been scammed before, I’d love to hear your experience with that as well. Just don’t give up on your dreams of running an online business, you can achieve it! Master Writing Jobs Scam: Why Pay For Something That’s Free? Luke is the founder of "That Marketing Dude", has been in internet marketing since 2005, and has been a writer for StoppingScams.com since 2014. He considers himself a nomadic entrepreneur, an adrenaline junkie, a fitness freak and a professional amateur photographer. Yes it is a scam! I myself have tried the trial version for $4,95 for 7 days. At the end of the 7 day period I was automatically charged for the full membership fee, without any authorization or consent! The content is outdated and dubious products for you to sell to potential clients (websites). I’m sorry you had to experience that, Andre. If I can help with anything down the road, please don’t hesitate to reach out. Thanks for stopping by and sharing your experiences with the community so other people can benefit from what you went through! Thank you for your comments. I had just read all about Traffic Brokers and wondering if it was legit so googled ‘is it a scam’? It did sound too good to be true. It is frustrating because I am just seriously looking for opportunities of working from home as a freelance typist, proofreader or transcriptionist and it is so hard to know who is for real and who just wants to take advantage of you. I know what you mean, Valmae. There are so many scams in this industry it’s almost impossible to know the 1% of legitimate programs from the 99% of ripoffs. I’m glad I was able to help save you a little bit of money – If I can help you with anything else related to internet marketing down the road, don’t hesitate to reach out. Very disappointed with your review. I was hoping to discover more than I already knew about what Traffic Brokers does and how it works. I’m surprised I didn’t actually realize it was Wealthy Affiliate 101, giving a bad review to another site, and offering WA as the good alternative. I feel silly for not seeing it coming. I may have to spend the $5 to find out for myself now, because I’m curious. I stopped at the point of the Clickbank payment and found you in a search. I take issue with your opinion that it reeks of scam. To me, it uses an anti scam kind of copy, because it basically promises that you aren’t going to make much, or possibly any, money for some indefinite amount of time, as you go about the learning process of walking before running. Furthermore, the guy admits that the big money he makes, is from doing other things than what you are going to learn there. You get the feeling there is a real limit to even what you will ever make there, even after you put in all the time and effort that is required just to learn to walk. That is so far removed from scam copy, I’m amazed you feel it’s in any way, typical. If anything, it seems to be so honest about the lackluster potential, it drives people away. From a scam buster type site that I learned about TrafficBrokers, as they recommended it as an honest program (and didn’t give an affiliate link to, btw), I understand it has something to do with learning the skills needed to drive traffic to client sites, and it has a step by step plans. That seems like something one could learn to use on one’s own projects down the road, when one is ready to branch out. From your review, however, I got only that they have some kind of make money online forum, and that is what you are paying for, rather than a specific program regarding traffic generation and helping clients. In other words, it was shoddy reporting on your part. If you paid the five bucks, you must have been granted access behind the boring curtain (and I mean, the dude makes it sound like boring and tedious work.) — it would have been nice if you could have taken the effort to give us some insight, instead of just saying it’s simply a marketing forum. I take it you were simply looking for material to make this post, and you took the lazy way out. If this is the level of work that WA inspires, I feel corroborated in my decision to have never joined them. PS – I’m not saying I know that TrafficBrokers is good. I just don’t have enough data, including from you, to be able to say I know it’s bad. It can’t be that much of a scam, at $50 a month, sane basic ballpark as WA. Just like if someone tries WA for a couple months before deciding it’s not for them, they didn’t get scammed out of some huge amount of money, but unlike TB, WA uses the word, wealthy, in it’s title. Yeah man, Everyone who joins is going to be freekin wealthy. Woohoo. And unlike TB, the WA copy says, “It’s free,” and they don’t mention the cost until you sign up. The more I think about it, the more I probably should write a negative review on WA to make what I offer as an alternative sound so much better. Hey Bomac, thanks for taking the time to leave such a thoughtful and honest comment. I really appreciate it, and I think the dialogue you’ve brought up here is very beneficial to the community. I take slight offense to being compared to the “typical” WA review site. Most “bootcampers” haven’t spent 10 years making a living in internet marketing, and they can’t tell a good product from bad when they purchase it and login (IF they even purchase it!). I started my review site to help protect buyers in this industry over a year before all of these “typical” WA Bootcamp sites started rolling out. Luke and I have been involved in internet marketing a heck of a lot longer than the average bootcamper that’s writing reviews after being in this industry for a month. I despise WA Bootcamp. I think what they’re pushing their is useless, very MLM-like, and changing the product for the worst every month that passes (I’ve made this opinion very clear to the product creators without much success at “breaking through” to them). That’s why I make it clear to my followers that they should avoid Bootcamp and stick to WA’s original training, which is really quite good for someone brand new to internet marketing without any idea of how to build a website. Due to how much it’s changed the product, I’ve actively searched for another product to recommend over WA and replace my top recommendation. It’s just not out there. I’ve looked high and low, and even though it’s far from perfect, it’s still far better than what we saw in Traffic Brokers. And on that note, you’re absolutely correct – this review doesn’t go deep enough. We need to purchase it again and revisit it, because we didn’t clearly convey all of the bad things we saw about the product once we purchased it. We got too distracted by the sales tactics used and critiquing the sales page, not digging into what we saw in the product enough. We didn’t communicate our ideas well or why Traffic Brokers isn’t a recommended product, but if it had topped what Wealthy Affiliate offers presently, I would have flipped it to my #1 recommendation in a heartbeat. I’m still actively looking for something that I feel is better for my website visitors, I just haven’t found it yet. I pledge no allegiance to WA, I just want people to get the best product to help them get started at a fair price point. As of today, even with it’s flaws and the complaints I have about the product, WA is still it. Thank you again for your criticism and honesty. I think a lot of people reading it will find it helpful, and it’s made it clear to me that we need to visit TB sometime in the near future. Hi, I’m from India and I’m really new to Traffic Brokers. Can you please tel me what kind of job exactly I would be doing, do you a person with no prior experience can manage this job. Hello Anita, I highly recommend checking out our updated review where we revisited Traffic Brokers to discuss the product in greater detail. Hopefully that will give you the answers you’re looking for. Let me know if you have any other questions after checking it out. Hey .. I am an 18 year old student from Pakistan and was really intrigued by traffic brokers because I have long term goals of having a luxurious life and atleast save about $500000 in 5 years or so and i thought i could make it easily from this traffic brokers but now I’m not so sure, can anyone help me with achieving my goals and guiding me sincerely and properly please? Work hard, provide value to people. If you can solve people’s problems and pains effectively and you don’t betray their trust, you can do very well in this industry. But it takes time and a great deal of hard work. Hi, I was looking at the traffic broker but felt it all seemed to good to be true so googled the name and ended up on this site. I have been sucked into a few things that have cost me a lot of money that I cannot afford so Ive learned not to jump without first checking it out. Im a professional person with A Bachelors degree in my chosen field. Now Ive reached over 50s shall we say, and Im no longer employable because Im a senior, on the top rate of pay. It makes good economic sense that why would you pay someone the highest rate of pay when you can hire a young person with 3 or 4 years post grad experience who can do the job for about $16 an hour less.!!!! Anyway, I don’t want to have to keep applying for positions that I know Im not gonna get a look in. Thats why I began looking to the internet to work from home, be my own boss, earn what I can rather than what someone is willing to pay me. Ive set up a website and am trying to get that going. Id like some education but have already spent all my money on crap that has got me nowhere. If you really do offer free courses that I can benefit from I will be indebted to you. Hey Trish! Thanks for the comment. Yes, the courses are absolutely free and, at the very least, they’re much higher quality than the training that’s available in Traffic Brokers. Feel free to sign up for any one of them and reply to the email lessons if you have any questions – that’ll come straight to my inbox and I’m more than happy to help any way that I can. Take care and best of luck! I have just “fallen” for the Trafficbrokers on line Scam, & now I’ve read your report I feel even more stupid. I recently had a serious motorcycle accident & can no longer work in my industry. I am therefor looking for another source of income. I have subscribed to his monthly payment scheme but want to cancel under the money-back promise but can’t find how to do so!! Hey Michael! It’s actually pretty simple. I’ve written up step-by-step instructions for getting a Clickbank refund, and by requesting a refund you will also cancel all future billing. I hope that helps! Thank you Ian, it’s good to see there are people out there with a heart. You have saved me money and wasted time. I am looking for help with earning money online. Any information would be greatly appreciated. Hello Mathew! Thank you, I’m glad I could help. Regarding building an online business, the best resources I could direct you to are my free training courses where I offer three very, very high quality courses absolutely free of charge. If you have any questions as you look them over, please let me know and I’ll do everything I can to help! I have also being scammed from this website. Their support dont wont to help me cancelling my order. The website have taken 50 dollars away from me already and i dont know how to get out of it. I need help. Hey Christian, just request the refund through Clickbank. They should process the refund on the seller’s behalf as long as it’s been less than 60 days. I’m not happy with them. The large number of hidden fees that were not disclosed upfront is a major concern. Am I glad to have come across your page today. I just signed up for the 7-day trial period of TB yesterday and was really eager to start. was having problem in logging in to their TB track site so I decided to pause and read on somethingelse and now this. If I hadn’t, I’ll probably be surprised of the 50$ that will be charged in the next few days which is really upsetting because they didnt tell you about it. I am sad but relieved somehow that I was able to ask for refund and I hope they will no longer charge it. btw, does cancelling thru clickbank also cancels the TB membership? I dont know how to now. thanks Ian. Hey Eileen! Glad I could help. Canceling through Clickbank should also cancel your membership as well, yes. Hi Ian! Thanks for the advise! I’ve been like three weeks doing my best to find a good online job, or something that gives me a little bit of money. But everything I find is a big thrash. And I don’t want to make 300.000 $ a month, not even want to make 1.000$… If I can, I woulnd’t complain. But here’s the thing. My country is kinda lame, I want to move but it’s impossible. Every job in here I will receive like “30 $ a month”, which I need to use to eat, to pay, etc, etc, and I’m working 9 hours a day… So, I was hoping to find one of those online jobs that actually lets me earn a little bit more. Do you think that is possible? Do you know of a good place where to start with? Because as I said before, I’m not expecting to earn 1000 or 2000 $ online… But if I can get at least 200 or 100, I would be reaaaaally happy. Do you think that is possible? I don’t mind learning new stuff, training, or whatever, I just want a way to make money, and the sooner, the better. I have to admit that I’m kinda desperate right now haha, but man, I’m passing through a Really hard time, I want to move on, to increase my earnings and to find a better way… But every door I look it’s closed. Can you give me a hand? Or give me a job!! I’ll do anything! hahaha, no but seriously, if you have any advise, please, I’ll be really grateful, because I’m running out of patience and ideas haha. Haha, thanks a lot for the message, Roberto! Have you checked out my free internet marketing training page? I think that would be the best place to start by far, and work you’re way out/up from there. How do I unsubscribe from Traffic Brokers? You can request a refund through Clickbank. oww. help me. i sign and pay that $4.95 through my credit card. it is possible that i will be charge another amount from my credit card without my confirmation? It depends on the offer you signed up with, but yes, it’s distinctly possible. Is he the same Jeff Walker who created Product Launch Formula ?